Mmm, I love to feed my geek side once in a while. Granted, I have an entire shelf (okay two) that is lined with geek paraphernalia; as well as walls lined with posters and a computer desk filling up with figures that lead to the notion of such... but once in a while I like to splurge even further and really delve into the title (of geek). Some times I feel foolish for spending money on things like that, but... it makes me happy :) So, every so often I just see something I WANT and I get it (if financially sound... there's lots of things I want but wouldn't or couldn't put such cash aside for them). << This is my most recent purchase. It makes my other Motoko Statue look puny in comparison (seen above in the background). 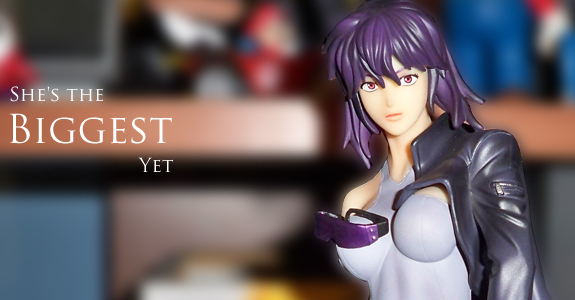 It actually cost less than my first Motoko statue - which also shot up in price since then; I'm glad I snatched this one now instead of waiting and seeing it for triple the price down the line. It, of course, is based on Major Motoko Kusanagi from the anime/manga Ghost in the Shell. Actually, more specifically it's from the S.A.C anime series... I forget exactly what part, the suit should be an indication... but I just don't remember... it's later on in the series, I'm decently sure. Anyways, I'm rather impressed with the build quality. It's near or on par with the job done on the Batman Arkham City statue that's included in the SE of that game. The pants are shinier than the rest, smoother too. The coat is smooth but with a more matte look and feel while the body suit piece and skin are much more rubber like. It's kind of kewl to have the different materials as it give's a some texture, both visually and by touch. Help fund Double Fine's new game!